Create a nursery full of adventure and wild playmates. A sweet Precious Moments giraffe parent and baby make this gift set truly special. Almost as adorable as your baby or toddler, this cute bamboo dinnerware includes everything you need to enjoy mealtime and snack time with your little blessing. Makes a great gift for birthdays, holidays, baby showers, and 'just because'. Hand-woven and handpainted bamboo, iron, sisal Give your little one the perfect bedding for all of his or her sweet dreams with the Animal Crib Bedding Collection from Carter's. Designed by Rebecca Jones in collaboration with Anthropologie, this playfully printed storage bin makes organizing toys that much more fun. Paper & Cloth brings together some of the UK’s most talented artists and illustrators to create an oeuvre that’s charming, quirky, and original. With each designer possessing a unique aesthetic, their collections vary in style, appealing to a full range of tastes - from preppy to bohemian. The Safari Hooded throw is perfect for the child adventurer. The hood features lion mane detail in a super soft plush fabric. Handcrafted dresser. Designed by Jeffrey Alan Marks. Hardwood frame and handles. Hand-woven natural lampakanai rope on outer sides and drawer fronts. Embroidered Bring wild child style to your space with this UO-exclusive tufted, tiger-shaped area rug. Provides a fierce accent to any room with bold patterning and a cushy, tufted pile. Extensive appliqués, embroideries, a jacquard border and metallic starburst and dots add a little sparkle to this exquisite collection featuring elegant giraffes, owl and moon on the quilt. The set includes a quilt, sheet and crib skirt. This four piece perfect fit crib bumper features a sweet gray giraffe on a white background with gold starbursts. The balance of the long sides are made of a soft gray sateen, gold and gray starburst decorate the back of the bumper and is 100% cotton. This Lambs & Ivy Signature Goodnight Giraffe Blanket is a beautiful gray soft minky fabrication with an appliquéd white moon and embroidered gold starbursts. The gray matte satin border is trimmed with a gold flange. Handcrafted stripe bone chest. Three drawers with pulls. Brass hardware. Fun, character designs liven up bath time or pool time. Also, perfect cover after a day at the beach or by the pool. The all-over terry makes the towel soft and absorbent. Comfortable and one size fits most. Based in the United States, British artist Andrea Lauren discovered her love of printmaking during a Lithography class in New York. Inspired by vintage picture books, folk stories, and walks in nature, she spends her days carving, printing blocks, and drinking tea. After contributing two years of research toward a Masters in Physiology, Ayla Graham returned home to Calgary, Canada to find a job in her field. However, her career trajectory took an unexpected turn when a skill she learned from her grandmother - creating art using pressed flowers - became her true passion. Putting a modern twist on this traditional technique, Graham'? ?s prints represent her connection to her hometown, family, and nature Born and raised in New York, Aimee's early exposure to the inner workings of the fashion world and her fine art background inform her bold and playful aesthetic. Here, a black and white motif is enlivened by gold metallic ink A precious baby shower gift, these artfully crocheted booties will be cherished for years to come. Hand woven from soft, natural seagrass, this multi-purpose basket offers a fresh take on the traditional bassinet. After your little one has outgrown it, it can be used for storing toys, books, and more. Working primarily with watercolor, Lucy Eldridge's eclectic, vibrant work showcases the artist's deep understanding of the world around her, from her unexpected use of color to the way she is able to meld opposite subject matters into one cohesive piece. What's black and white and loved on every continent? A zebra, of course! Nearly three feet tall and over three feet long, this beautifully constructed and detailed zebra has dramatic markings, an affectionate expression and a fuzzy mane! Handcrafted zebra chair. Solid pine frame. Linen/cotton upholstery. Polyurethane/polyester fill. This tasseled sconce draws the eye with its textured charm and balanced blend of bohemian and traditional styling, filling your space with warm light. Melissa & Doug plush hippo. Wrap your baby up in warmth and comfort with the Levtex Baby Zambezi Blanket. Made of soft grey plush fabric with an adorable grey pompom trim, this blanket features a cute corduroy and felt orange and brown lion appliqué and the sentiment "You're Cute And I'm Not Lion" at corner. Handcrafted print with acrylic backer. HD metal is a fine grade of aluminum. Creates luminescent highlights and deeps darks. High impact statement piece, handmade. Your little one can pretend to sightsee in the Savannah with this delightful, safari-inspired decorative garland hanging overhead. Artfully wrapped rattan adds an airy, textural accent to your well-lit room. Handmade rug. Hair-on leather hide. Leather panels woven within a natural teak frame create an inviting place to sit - and lend a casual sophistication to any space. Here Kitty Kitty Set includes fitted crib sheet, dust ruffle, coverlet, and diaper stacker. Wild and fun Here Kitty Kitty is a beautiful 100% cotton nursery set. A combination of hot pink on tiger skin. Dust ruffle in hot pink and sheet in cheetah skin print. Coverlet in faux fur cream and pink with minky backing. 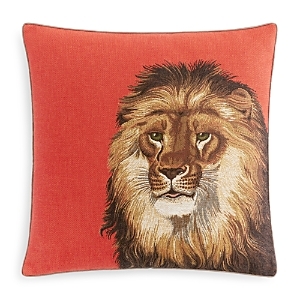 Bring the wild world into your space with this luxurious velvet floor pillow, available exclusively at Urban Outfitters. Canvas base with patterned velvet top panel featuring tufted embroidery and rich, vivid colors in an oversized tiger-shaped silhouette that offers cushioned, low key seating. The Levtex Home Mariska Giraffe Pom Pillow includes a duck feather insert with a decorative pillow 18" x 18" in multi, white, teal colors. With its intricate place print damask design, the Mariska collection accents your home decor with a global look that looks alive and bright. Perfect for your little one's nursery or as a playful touch to your home office, this hand-woven elephant bust is a charming addition to any space. The perfect finishing touch to a jungle-theme nursery this Reed & Barton water globe will enchant your animal-loving explorer with it's bright colors and happy animals. Michael Aram "Animals" handcrafted picture frame. Approx. 8.75"L x 8.25"W; hold 5" x 7" photo. Nickel-plated metal with enamel coating. Woven from natural raffia, this impeccably crafted piece is inflected with a modern, bohemian edge that elevates any space. Super-soft, super-cozy Swankie Blankie baby accessories feature a fun cheetah print of plush velour. If desired, personalize them with embroidery. Each is handmade in Texas. When it's time to get a little wild, Creative Bath's Animal Crackers Collection answers the call with a wonderfully whimsical menagerie. From kids' bathrooms to guest bathrooms, a fiercely fabulous cast of characters are set to take any space on a stylishly silly safari. When it's time to get a little wild, Creative Bath's Animal Crackers Collection answers the call with a wonderfully whimsical menagerie. From kids' bathrooms to guest bathrooms, a fiercely fabulous cast of characters are set to take any space on a stylishly silly safari When it's time to get a little wild, Creative Bath's Animal Crackers Collection answers the call with a wonderfully whimsical menagerie. From kids' bathrooms to guest bathrooms, a fiercely fabulous cast of characters are set to take any space on a stylishly silly safari. Swankie Blankie hooded towel. Tiered contrast creates lion's mane. Ear detail at top corners. Secured with tulle ribbon at center. Rubber duckie included. Cotton; hood with cotton lining. Made in USA. Turn bath time into an adventure with the brightly-colored animals and fun natural designs of this Origami Jungle shower curtain from Creative Bath. Bring lighthearted fun to your child's bath time with Kassa Jungle bath towels from Kassatex, crafted in soft cotton finished with an adorable tufted pattern. Turn bath time into an adventure with the brightly-colored elephant design of this Origami Jungle soap dish from Creative Bath. Turn bath time into an adventure with the brightly-colored animals and fun natural designs of this Origami Jungle covered jar from Creative Bath. Turn bath time into an adventure with the brightly-colored animals and fun natural designs of this Origami Jungle lotion pump from Creative Bath. Make every day an adventure with the friendly animals that inhabit the Kassatex Kassa Kids Jungle bath accessories collection. Make every day an adventure with the friendly animals that inhabit the Kassatex Kassa Kids Jungle bath accessories collection.